Take Back Your Weekend! Trust Your Lawn to the Experts. Enter your postal code to get started on your custom quote. By completing this form you understand and agree to the terms of our Disclaimer. Have you considered seeking out professional guidance and treatment options to help keep your landscape free of Emerald Ash Borer infestations? This pest is an invasive insect that limits it infestations to ash trees. The beetle can travel quickly around town, making it possible for infestations to arise in ash trees just about anywhere.Should you suspect that your ash trees could have a potential infestation, now is the time to contact one of the tree specialists at EspacesVerts.We can help keep your trees healthy. An infestation of the Emerald Ash Borer can kill your trees if it is not treated properly. So, if your tree has become infested, you must decide if you want to remove the tree or protect it from more infestations.Tree experts at EspacesVerts can provide you with specialized advice and unique insight, helping you figure out the best way to fight these types of infestations.A little help from EspacesVerts can go a long way in your fight against infestation. TruMaintenanceSM This program provides maintenance level fertility and guaranteed broadleaf weed control utilizing our Weed Intervention® process. TruCompleteSM Our most comprehensive program. Enjoy all the benefits of TruHealth, plus annual aeration and overseeding. The Emerald Ash Borer affects the health of your ash trees by burying itself in their bark, disrupting its ability to circulate water and nutrients. As such, an infestation is likely to result in the decline of your tree’s health and ultimately it's death. EspacesVerts can help you to assess the issue and provide the most effective treatment option. 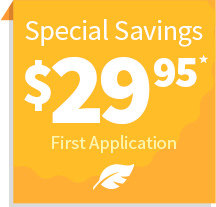 Dedicated to helping protect the health of your trees, EspacesVerts helps to fight infestations of these pests. EspacesVerts has local tree care specialists who can help. The secret to stopping the spread of this pest is to obtain professional treatment in Blainville from EspacesVerts, as soon as possible. Call EspacesVerts for specialized solutions in fighting off this pest in your landscape. *Based on Canada market survey of professional lawn care companies. 2016, NorthStar Partners Canada Share Tracker. EspacesVerts approach to lawn care The EspacesVerts scientific approach adds up to a great lawn. Call EspacesVerts now at 450-232-0600 or fill out our form. Let’s get started with your TruHealth lawn plan. Complete the form to get your custom quote.